Learners need guidance on designing a survey. That is covered in many places including pages 312-322. Be sure to have done some Access before you start the PAT to show learners its possibilites in processing information. Definition - Must focus on what YOU want to do with Cybertracker, Survey, Excel, Access and PPT to solve THEIR problem. Questions - What questions must YOU ask to get get information so that YOU can do the things YOU want to do in each of the 5 sections above, in order to solve THEIR problem. Survey - Focus on one thing, e.g. facilities, guides, hours, etc. Show/prove how a survey can help them. Try this fun presentation to check if you have grasped all the features of the PAT. Use this quiz to consolidate knowledge of Access datatypes. 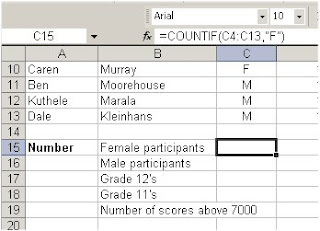 Use this quiz to check if you can identify common errors in Excel. The information was found on Page 150 of the Grade 11 book. A primary key plays an important role in a database. Use this test to consolidate knowledge of the primary key.